Toronto, located in the province of Ontario. I actually came here for the first time last summer. But this is the first time I’ve been here for tourism purposes. 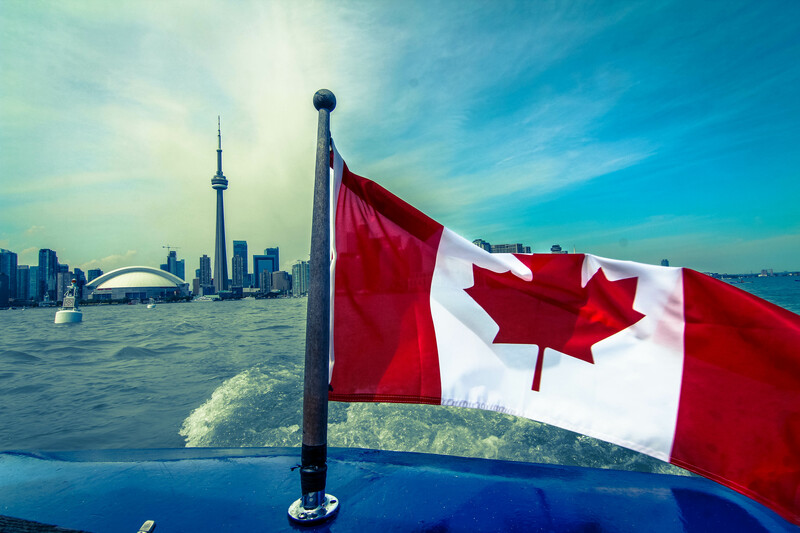 In North America, Toronto is the 4th biggest city, next to New York, L.A., and Chicago. So in other words, it’s the biggest city in Canada. 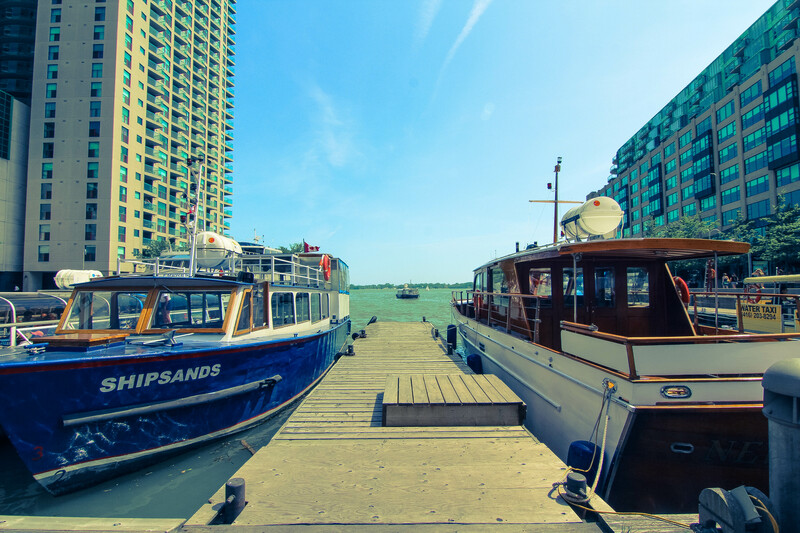 Lake Ontario, viewed from downtown Toronto is a sight to behold. If you didn’t know it was a lake, you might think it was the ocean. You can’t see the other side, it seems to continue on forever. If you go to the port, you can go on a cruise tour. 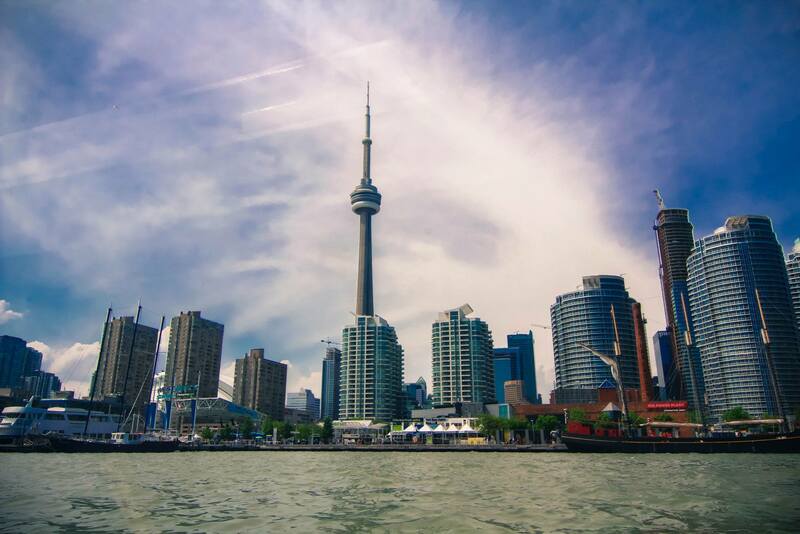 The Toronto skyline, seen from the lake, is gorgeous! 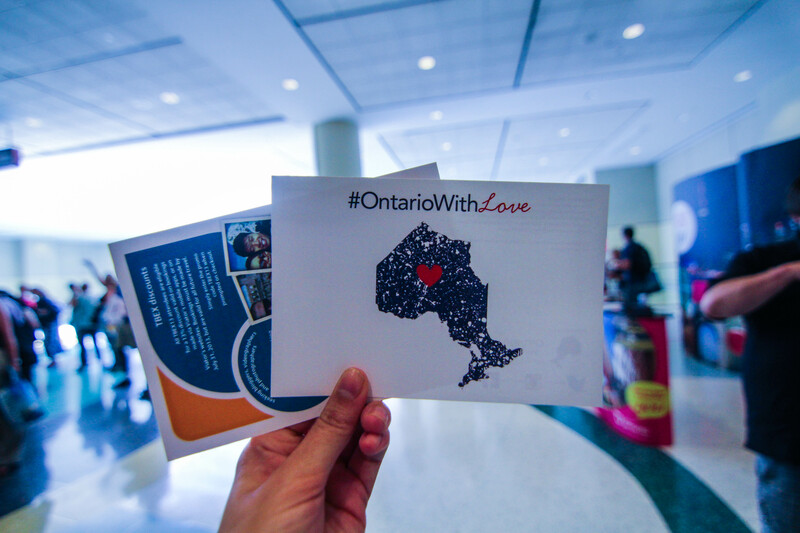 Oh, I guess Justin Bieber is from Ontario too, right? 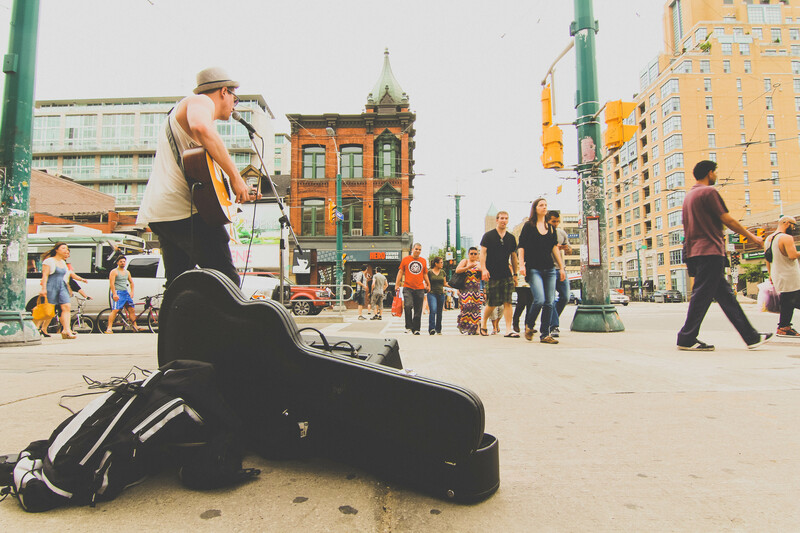 If you walk the streets of Toronto, young musicians playing energetically creates a very cool scene. 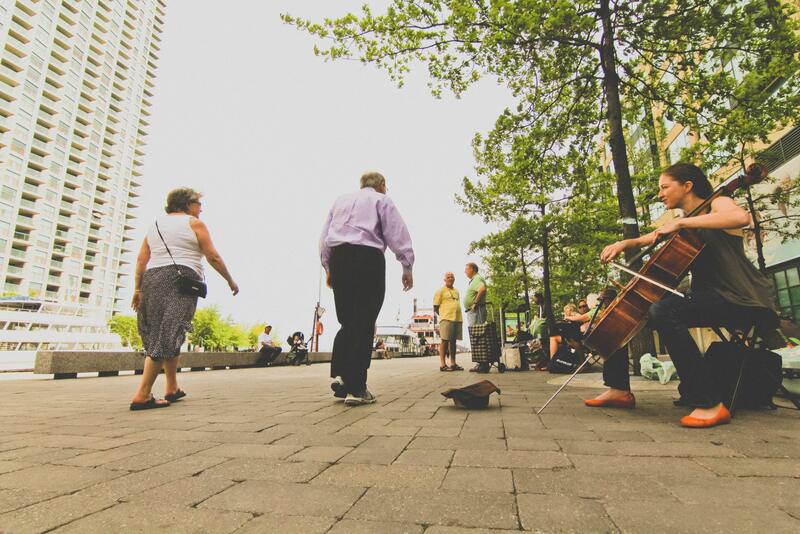 You can find anything from people strumming their acoustic guitars, to young girls playing their cello in the shade. Coming from someone who studied at Music School, these things make me really happy. My friend in Toronto showed me around. 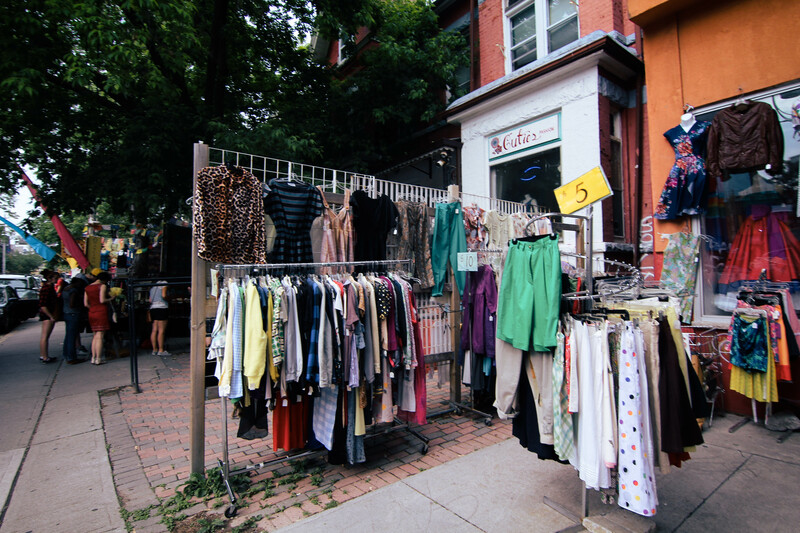 Even just wandering around the streets of Toronto, there was lots to see. It’s quite common to see brightly painted street art in the alley ways. 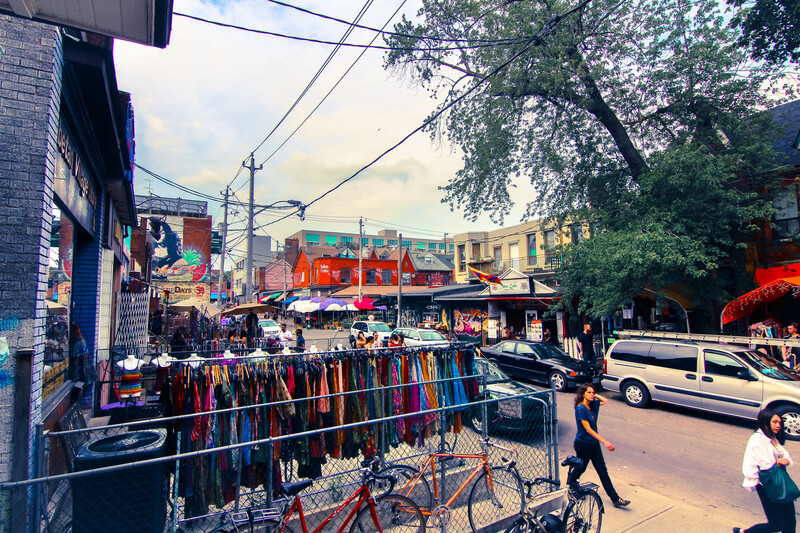 My friend recommended I check out Kensington Market. Just like Takeshita St. in Tokyo, you can find trendy looking houses, and clothing sold on the street. You can buy cheap clothes here in styles you can’t find in brand shops or the mall. It was fun just to wander around this street. 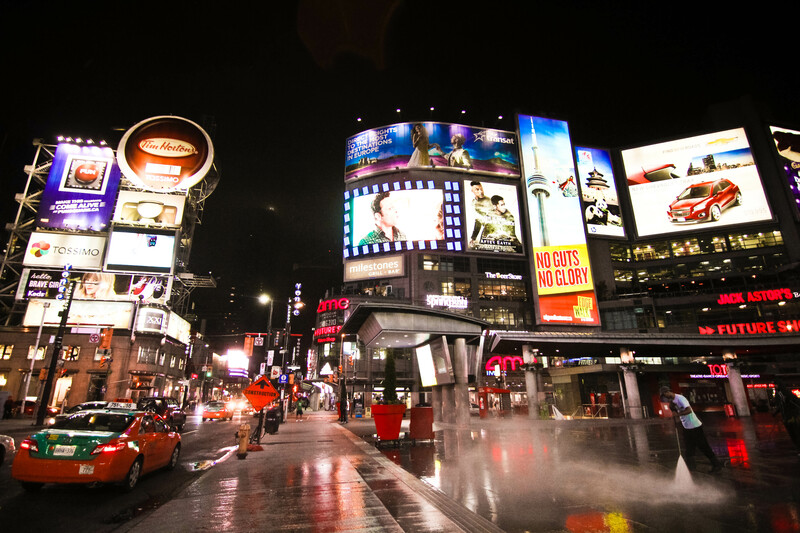 And finally, there’s Yonge St. The brightest street! There’s one in every major city. 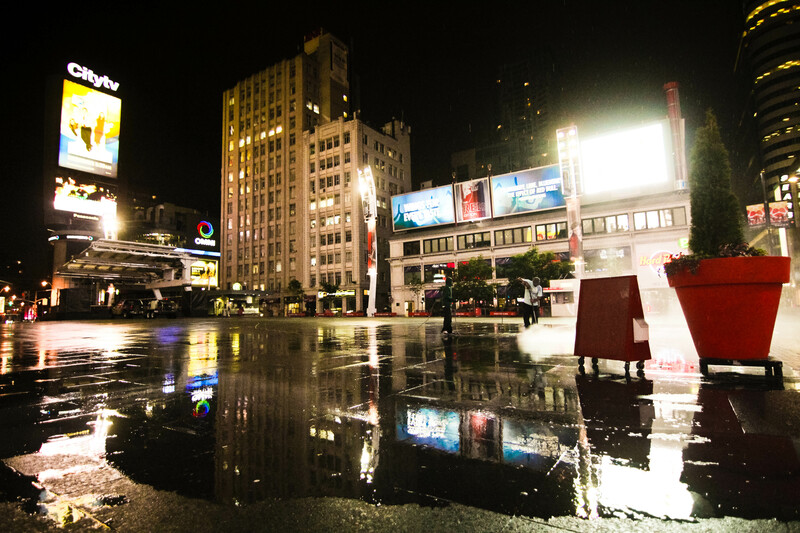 It reminds me of New York or Tokyo. 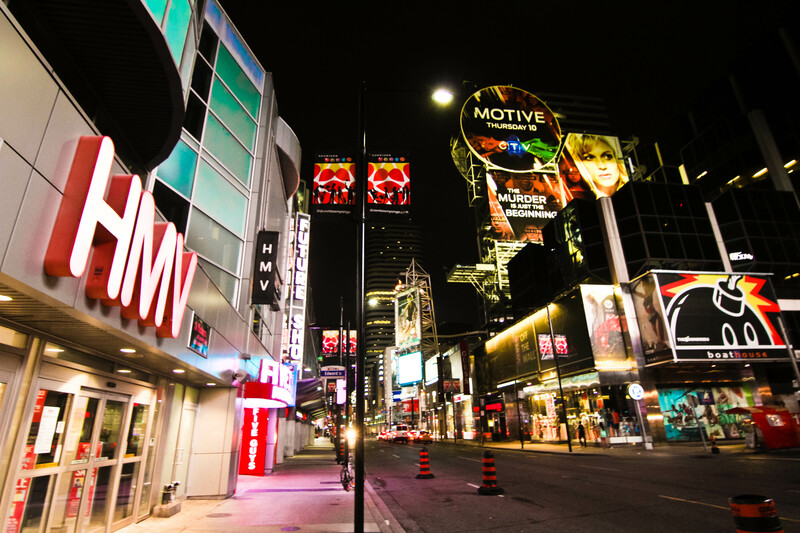 Advertisements shine brightly in the exciting downtown core. The busses here run 24 hours a day. I wish Japan would do that too sometimes. It was a long trip, but I’m glad it ended in Toronto. It was stimulating right to the very end! Unlike Japan, Canadians seem to take each day slowly. Sometimes it seems like they might move a little TOO slowly, but everyone speeds up in big cities. 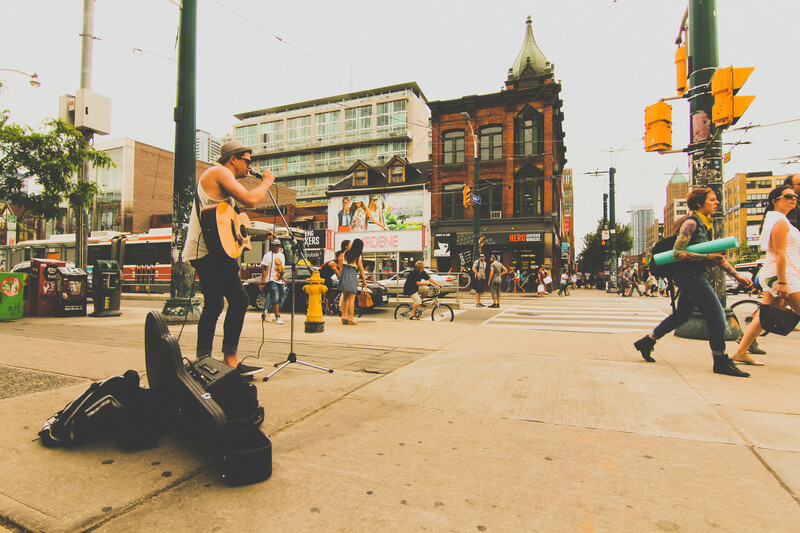 I feel like Toronto is in tune with my life rhythm. I actually feel like I’d like to live here one day. That’d be way in the future though! For now, I’m looking forward to being back in Japan. I’m REALLY into taking photographs lately. Have you noticed? I’ve been a bit heavy with the photos. I can’t wait to try taking nice photos of Japan too! I’ll visit you again soon! Posted in Canada, Micaela, Tourism, TravelTagged とろんと, オンタリオ, カナダ, カナダ観光局, ツアー, トロント, ブログ, ミカエラ, Blog, Canada, Canadian Toursim, ciaela, CTC, English, ESL, 英語, japan, japanese, Micaela, Ontario, Toronto, 写真, 旅, 日本語Bookmark the permalink. The photos are all so colorful and the blu sky in the first few photos just adds to the atmosphere. I’d love to visit Toronto some day! Wow! You’re so fast! Haha. Thanks. I’m going to focus more on the quality of my photos from now on. I want there to be more value in my blog posts than just hearing about my day. You do look happy and relaxed in that photo. Glad to hear there will be some more photos on your site. Thanks Nicole! Working with people like Maurice, Rishad, Kris, and Alex definitely inspired me to try harder to make an impression with photos, but people like you have inspired me to work harder on making my blog into something that people can enjoy! Darn!! I missed you while you were in Toronto!! That’s where I live! I work right downtown, within walking distance of many of your photos. I’ve been following your blog and videos for 18 months now, and so kicking myself that I missed an opportunity to meet you in person (always figured I’d have to go to Japan!). 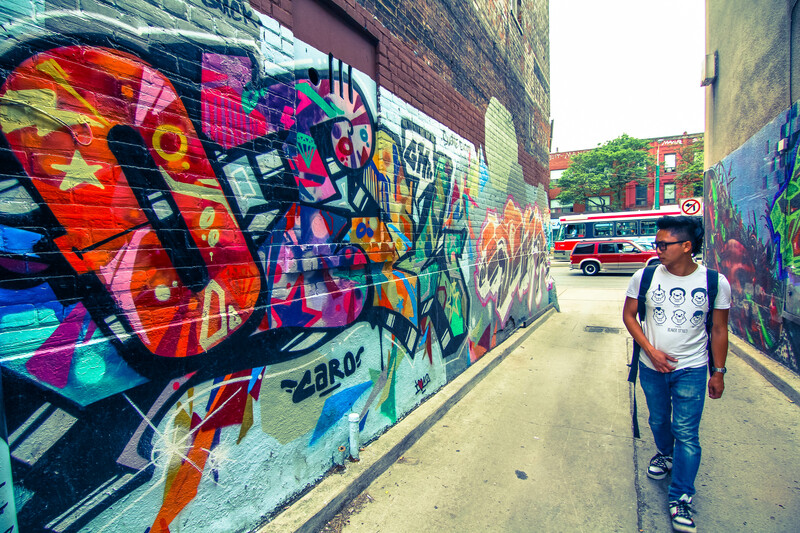 LOL, anyway, I loved your overview of Toronto, you captured many of my favourite elements…. 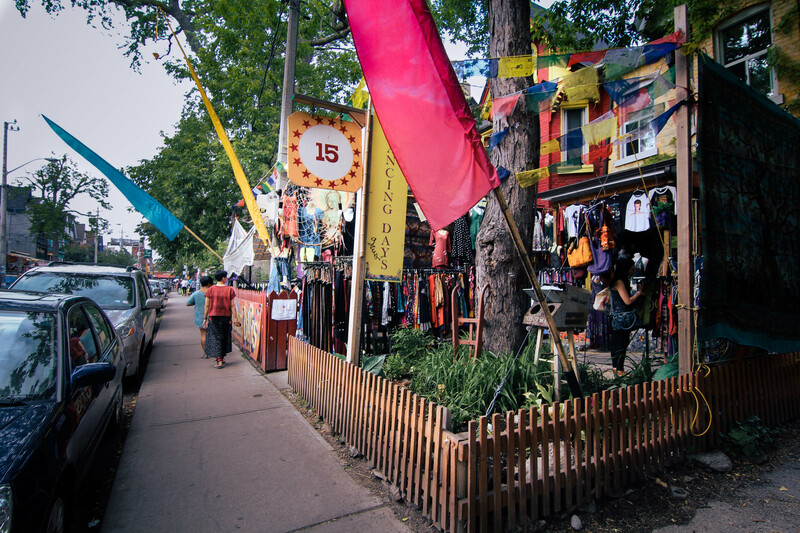 Also, I lived in Kensington Market for a few years, too. Whoa, whoa, get out the way with that good inotrmafion. I　commented your blog for the first time . I live in saitama and go to prep school everyday . Your blogs and photos are amazing !!! For now , i sometimes comment your blog . Oh! I looked it up while I was writing the blog entry, but the information I had must have been outdated. I’ll double check! Lol I’m so confused , aren’t you guys forgetting Mexico City? According to wikipedia, it’s Mexico City, New York, Los Angeles then Toronto. Darn, I live in North York and would have loved to help show you around. I have been to Japan and love the culture; I honestly feel I lived there in one of my previous births! 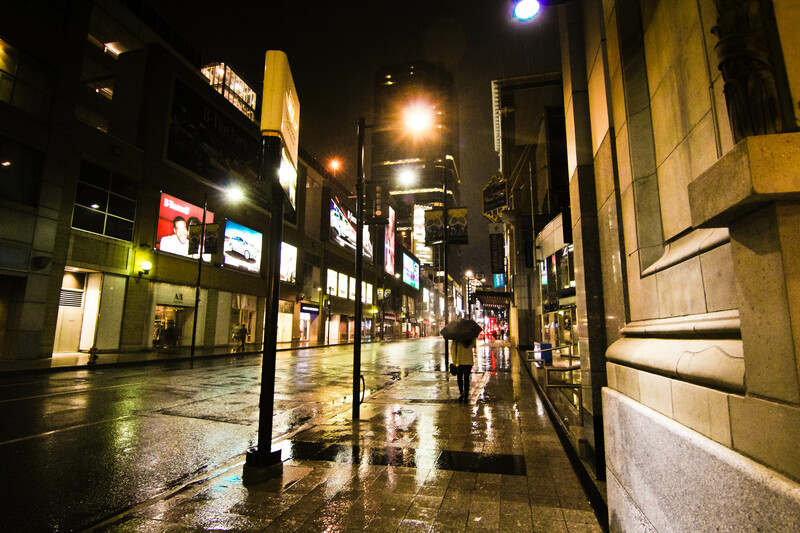 Now, having said that, I do know a few cool places to visit in Toronto owing to my love of photography. I travel worldwide extensively, typically 3-4 months a year so I’ve seen a thing or two, however Toronto is where I feel most comfortable. Your new blog style is good! I think Tront is really nice city. I went there for my visa renewal before and would go again for my visa renewal by next FEB. When I visited there, I enjoyed not only viewing but also many good food. Especially Chinese cuisine taste is amaging compare with US. Now I live in Michigan. I like Canada more than US. In Canada, you use metric weights and meaures. Here in US we use English. Metric is much familier with Japanese such as deg C in tenperature, km/h in speed, m in length, g in weight and ect. I hope you will enjoy the rest of stay in Canada and trip back to Japan safely! It is translated word to word from English. Most usual way to say in Japanese is ”気をつけてお帰りください”. 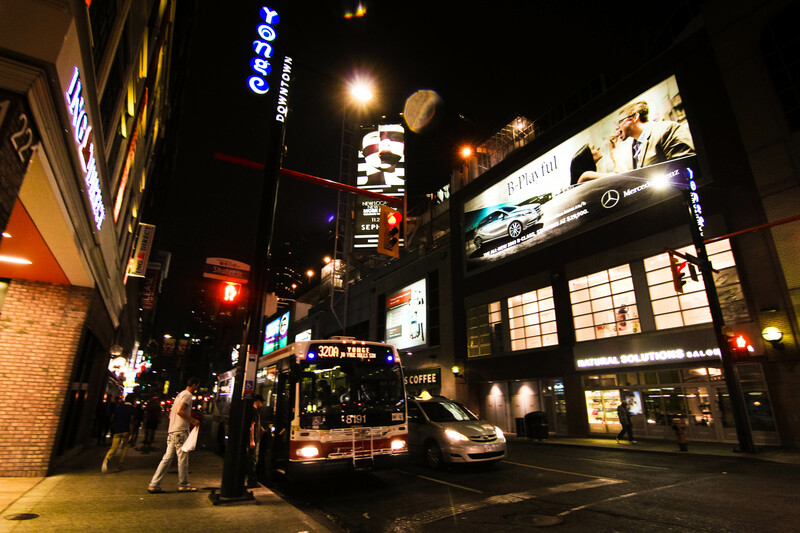 Your blog about Toronto reminds me my days there! I came back to Tokyo 3months ago after spending a year in Toronto. It’s not too busy, and people there seem to enjoy their life. I don’t hate Tokyo, but I feel like Toronto is for me like you. I’m really glad you gave the chance to have Japanese know about Toronto! Since not many Japanese even have heard the name of the city “Toronto”. And I enjoyed the other videos of your trip! Via rail was so comfortable to me too like Shinkansen. I’m sorry I’ve never commented, but as a fellow Canadian living in Japan (6 years now! ), I’ve watched your videos many times on youtube, but this is the first time I’m checking out your blog. Great spot you did on Canada and VIA Rail! I used to commute from Guelph to Toronto everyday on VIA Rail, so it has a soft spot in my heart as well. One time, I even took it all the way east to Halifax, so I can appreciate your Vancouver to Toronto experience. Canada is so frickin’ big, eh? BTW, were you in a commercial here in Japan recently? I was so shocked to hear English spoken so well and so quickly, I forgot what the commercial was selling, but you were in a car and said you were Canadian at one point… ??? Anyway, congrats on all your successes! And maybe, just maybe, we’ll both return to Canada one day and bump into each other in Toronto… ha ha!